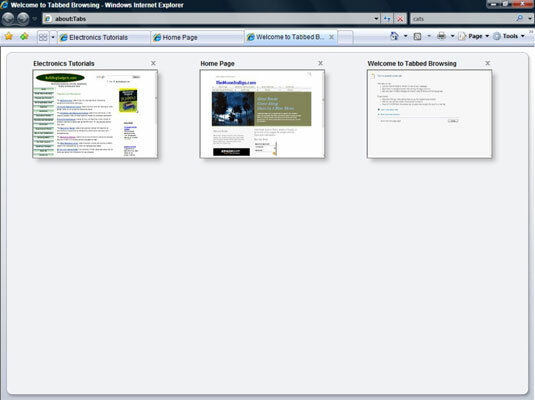 A tab is a sort of window within a window that you can use to view any number of sites. When you work with tabs in Internet Explorer, having the ability to keep a few tabs open at a time means you can more quickly switch between two or more sites without navigating back and forth either with the Previous or Next buttons or by entering URLs. 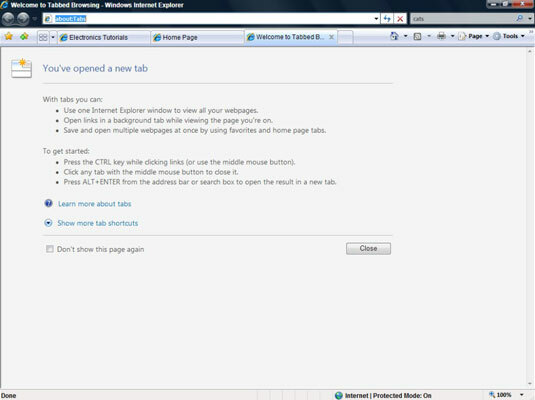 1With Internet Explorer open, click New Tab (the smallest tab on the far right of the tabs). You could also press Ctrl+T. 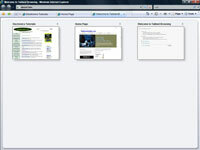 A new tab appears, displaying some information about tabs. 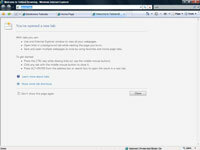 2Enter a URL in the Address bar. URL stands for Universal Resource Locator and is just a nerdy way of saying web site address. Although the full URL for, say, Dummies.com is http://www.Dummies.com, you can just type www.dummies.com and IE will finish it off for you. Quicker still, if you just enter dummies (or microsoft or blogger) and press Ctrl+Enter, IE will add http://www. before it and .com after it. 3Ctrl+click a hyperlink to open that hyperlink on another page. Holding Ctrl down when you click a hyperlink will automatically create a new tab that will open to the link you clicked. 4Click other tabs to switch among sites. Your Web sites will stay open on each. This can be a real time saver. For example, it’s particularly handy when waiting for media to load on one tab; you can start looking for new information on the next tab. 5Click the Quicktabs button to display a thumbnail of all open tabs, or click the Tab List button to display a text list of tabs. The Quicktabs button consists of four little squares on the far left of the tabs. The Tab List button is the arrow to the right of the Quicktabs button. 6Close an active tab by clicking the Close button on the right. Also, if you want to keep one tab open and close all others, right-click the tab you want to keep open and choose Close Other Tabs.